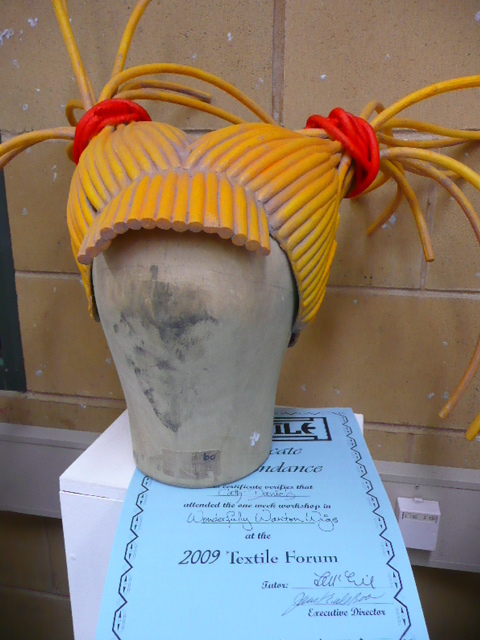 My friend Cath, a newcomer to wig making, created this at her workshop. 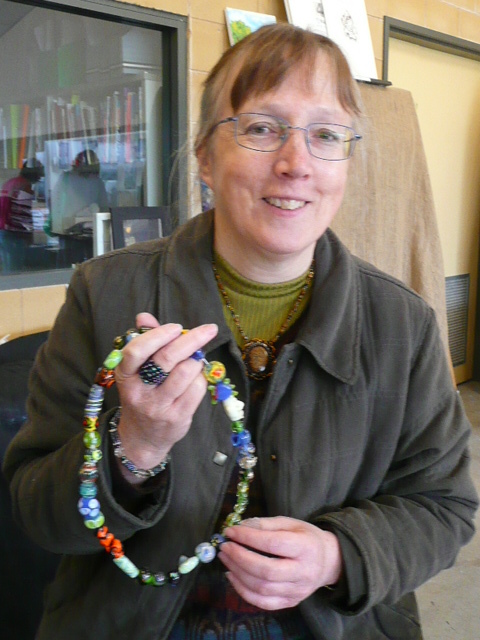 Jane whom I know from events at the Quilters Guild of NSW, made these beautiful glass beads at her 5-day workshop. They are sooooooo lovely. Two very adventurous ladies Jane and Cath created marvellous pieces of work at the Orange Forum. You can view more of Cath’s work on her blog Cathart-ic. It was a pleasure to see their pieces of work – take a good look at these photo’s. Another friend Rory from Mudgee also created stunning shibori woven pieces. Unfortunately my camera played up and I am unable to show you photo’s of Rory’s work. She often sells her woven products at local markets, so if you ever come across her work if you are around the Mudgee area, I am sure you will be a fan of her woven works too. Driving home from the Orange Forum I had one completed bag, one under way, and a bag full of good times spent with creative souls. Over 2o0 people attended the Forum; the last day was open to the public so the numbers swelled. Here’s a photo of my completed bag, and the other. Well its back to work now to finish my second bag, and start on a commissioned quilt for a lady’s birthday in June. 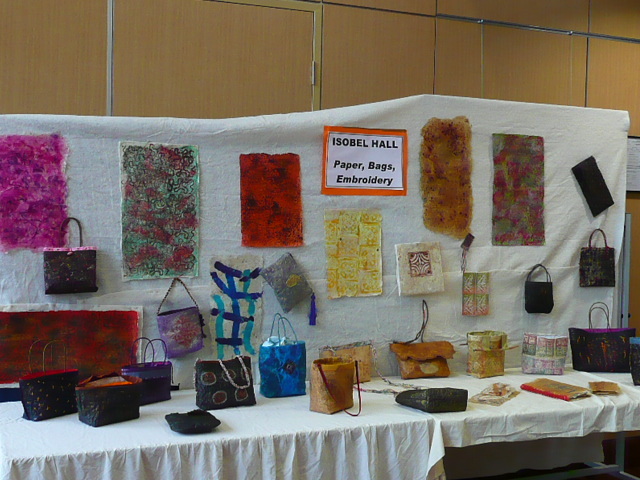 Bags, tags, book pages were made by our class with Isobel Hall. A picture shows it all! We learnt to make paper from coccoon strippings! 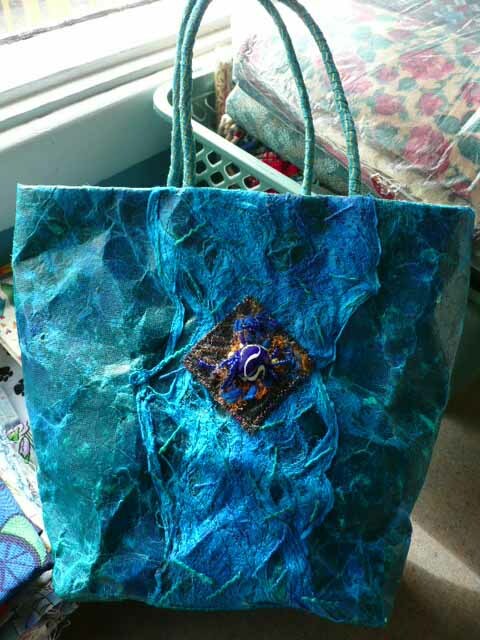 Besides forming a very strong base for embellishment, this fibre produces stunning bags and other forms of paper products. Here is what our class produced in just five days with our “L” plates on!. 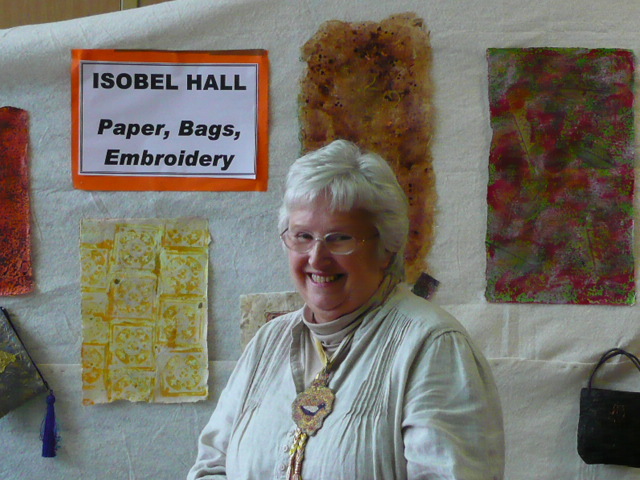 Isobel Hall, teacher and author of ags with paper and stitch, is working on two more books. Here Isobel stands proudly with the work which we, her students, produced at the TAFTA Orange Forum this month (April 2009). For five days with Isobel Hall our teacher, our group of 13 worked out little hearts out playing with mixed media. I must say though, that the hard work was coupled with good humour and a positive approach to any little problem that emerged. We all produced beaut bags, tags, and/or book papers. Working with acrylic and encaustic waxes, a myriad of different paints and embellishment powders, and sorbello and other stitches, our work took the eyes of all visitors to the Forum open day – this is held on the last day when the general public visit to view and purchase pieces of art and craft. Isobel Hall provided us with devoted and skilled assistance – as a result we each produced innoviate and individual work. We left Isobel with much fondness in our hearts. I completed one bag – a blue one which design and coour just emerged during the workshop. I also partially completed a second bag which will shortly be completed – photo’s of both will be available for you to see, tomorrow. So please revisit then. The Forum was also a good time to catch up with my fibrefriends from an on-line group – Cath from Melbourne, Rory from Mudgee, and Kaite from Bathurst; and then also Jane from my Sydney based quilters guild. Amazing work was produced – and photo’s will be uploaded shortly. Please revisit a little later this week for further details of the TAFTA Forum at Orange. 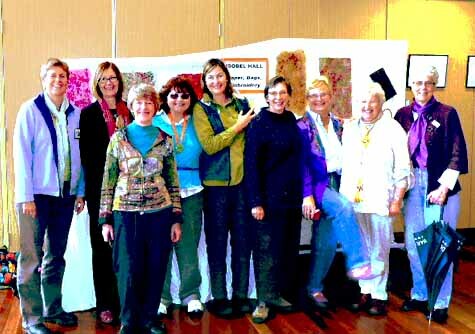 “Gowing to Pizzas” wall quilt was made for a Quilters Guild of NSW challenge. The theme of “GOING TO PIECES” was depicted bv the disappearance of Gowings stores – a favourite of the man in my life. 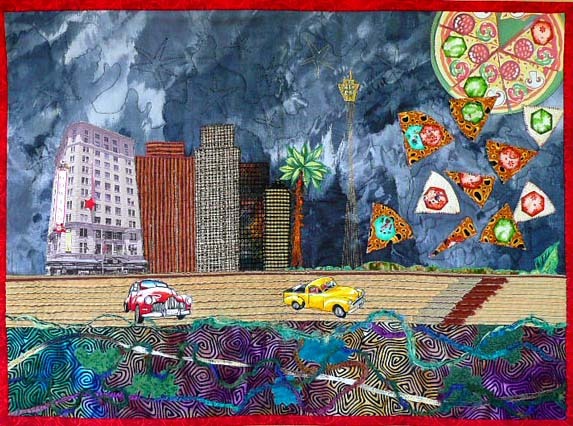 As Gowings departure seemed to cooincide with the influx of many pizza shops in my city, it seemed fitting to produce my quilt “Gowing to Pizzas”. This wall quilt measuring 69 x 50 cm has just returned home from travelling nationally with the challenge collection of quilts. Having now many quilts oozing from the rafters at home, I am thinking I will sell this one on e-bay, unless someone sees it and contacts me first. I am happy to let it go for a nominal price only. It is in excellent condition. Reflecting colour and humour, it depicts a time that has gone to pieces. 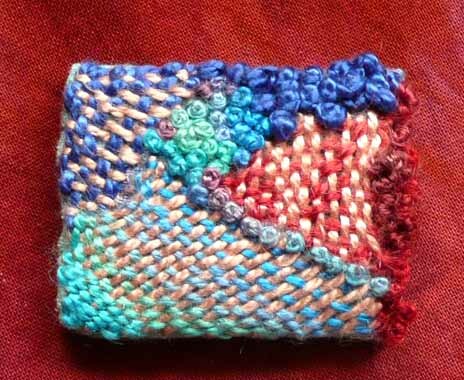 Reading various blogs my eye spotted an appealing woven brooch – and luckily my friend Erica gracefully responded to my enquiry by posting the full instructions on her blog Creative Dabbling. I found them to be very clear and easy to follow; and the weaving process felt quite meditative and so relaxing. A small adaption was required – french knots served to enhance my loose weaving … next time I will know better. Erica described the process as being pretty simple and could be applied to add texture to textile art and ATCs. to see her tutotial or just dabble amidst her creative ideas. 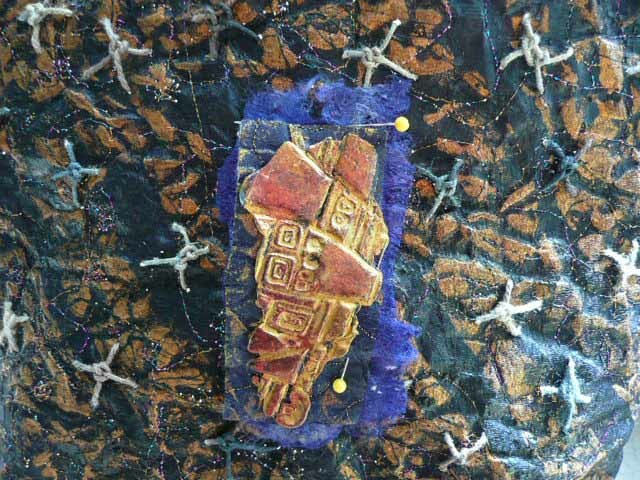 You are currently browsing the Crafty Quilting with Pamela blog archives for April, 2009.